and build your team today! Posted by Who Got The Assist? 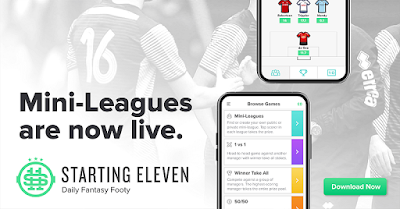 Starting 11 is a new Daily Fantasy Premier League football game and app, which has gained in popularity since last year as managers get to pick a brand new fantasy team each week, without the headache of managing a season-long team. If you’d like to get involved this week by challenging us, simply create your lineups today via the free app. After scoring four goals and recording an assist during his last three games, Mohamed Salah is BACK! And in fine form from his new advanced position playing at the tip of the Liverpool sword. Those doubters who described Salah as a one season wonder are being made to eat their words after the Egyptian scored his eleventh goal of the season with a further six assists already to him name. On Boxing Day, Liverpool are at home to Newcastle – a fixture with a history of goals and an opportunity for Liverpool to continue their fine form and keep Manchester City chasing. We’re spoilt for choice on Boxing Day, who will fill your three forward positions? Salah, Hazard, Aubameyang, Kane, Sterling…..
For me, that makes Rashford a differential. He's bolstered with the excitement surrounding Old Trafford as well as his form and the fixture – I think he warrants a starting place in your teams this week. Huddersfield haven’t won a game during their last five outings and have conceded nine goals during that period. After the sensational match on Sunday which ended 6-2 to Spurs away at Goodison park, Christian Eriksen made it two goals in as many games. Having had his minutes managed due to the Champions League, Eriksen is now back and looks to be firing on all cylinders. Up next Spurs are at home to Bournemouth, who have been a surprise package this season but have now lost six of their last eight games. So you want to make the most of Manchester United players, but who to choose? Many will back Rashford with Lukaku out for Gameweek 19, others will head for Pogba – however Jesse Lingard’s performance on Saturday evening makes him worth considering. Two goals and an assist during Solskjaer’s first game in charge, playing on the right of a front three – I think we can expect to start seeing the goal scoring Lingard we were treated to last season. It’s interesting that Lingard scored a penalty on Saturday with Pogba on the pitch, however Solskjaer did confirm after the game that Pogba remains the teams penalty taker. The best centre-back the Premier League has seen in recent years? Well, he's certainly one of the most inform defenders at the moment. Not only has he tightened up a notoriously poor Liverpool defence but continues to be a constant goal threat from set pieces, as seen when he scored against Wolves on Friday evening. Newcastle have only scored three goals in their last five games and are likely to struggle again on Boxing Day. There were clearly a number of tactical differences to a Manchester United side under Jose Mourinho to that of Ole Gunner Solskjaer - one of those being how Lindelof had a license to bring the ball out of defence and create chances with penetrating through balls. Any fantasy football manager looking for Manchester United coverage will probably opt for Shaw, but if you are looking for a differential then I think Lindelof can be your man on Boxing Day. A clean sheet is likely. But if he performs the way he did against Cardiff then I wouldn’t be surprised to see an attacking return too. Manchester United performance on Saturday was enough for me to consider a Manchester United defensive stack. They were unlucky to have what was a harsh and unnecessary penalty awarded against them, which ultimately led to the loss of their clean sheet. Cardiff were playing at home but were limited to only three shots on target, with Manchester United at home against a Huddersfield Town side who have only scored 11 goals all season I think a clean sheet will be forthcoming. Guaita's two game stint has seen him keep a clean sheet against Leicester and register a stunning win against Man City. He’s staking a claim to hold onto his place in the starting line-up. On Boxing Day Crystal Palace host Cardiff City who are still reeling from their 5-1 defeat to Manchester United. He’s definitely a punt, but if you are looking for a differential goalkeeper for Gameweek 19 then why not Guaita? Before you go… Starting 11 have recently introduced a new Mini-League feature to their app, giving you the opportunity to compete in public or private leagues or two or more managers where the winner take all. Download the app now and try it yourself. Whilst Jose Mourinho's sacking has dominated the headlines this week it's time to turn attention back to on pitch matters. The season is almost at the half way stage and we're about to enter the hectic festive period. What does all of that mean from a Fantasy Football perspective? This weekend is Gameweek 18 and with weeks 19, 20 and 21 to follow in pretty quick succession, this preview will combine all four sets of fixtures. The squad rotation of certain managers has already proved frustrating throughout December and with the added Boxing Day and New Years Day games to factor in, your mini leagues might look very different by January 3rd. Here are five players who might be useful during this hectic schedule. My advice would be to look at the four weeks as a whole as there's bound to be some rotation and even injuries to factor in - having a good bench has never been more important! Kane has polarised opinion this season. Many are put off by his price tag and that was justified after a slow start to the season. Whether that was down to the World Cup or not can be debated all day but the fact is he has "blanked" only once in his last 7 league appearances. Even that was when he was rested to the bench against Leicester. Everton away is not an easy start to the festivities but home games against Bournemouth and Wolves followed by a trip to Cardiff look more like the type of games that Kane will thrive in. During his last 4 Gameweeks he has had the most shots in the box (11), the highest number of big chances to score (8) and has the best xG of 2.95. With a home tie against Burnley he’s due a haul! Burnley have conceded 33 goals this season, only Fulham have conceded more. Provided he starts, this is the perfect chance for Aubameyang to get back on track. A new manager and a new beginning for Manchester United in Gameweek 18? Their worst start to a season for 18 years makes any Manchester United player a differential. Rashford is a player that has showed some recent form and is someone the fans will to be prioritised under the new manager. After being given his opportunity and starting the last four league games, Rashford has only scored once but provided four assists. This weekend Manchester United take on the Cardiff who like Burnley have conceded 33 goals. Cardiff have steadied the ship a little but still look a little out of their depth at times in the Premier League. It’s becoming harder to ignore Felipe Anderson with every Gameweek that passes. During his last 7 games Anderson has provided 7 attacking returns, in the form of 5 goals and 2 assists. This week West Ham host Watford, who have conceded 11 goals in only 5 games. The Hammers are starting to take advantage of their favourable fixtures that stretch out into the New Year. Time for #Pogback? After a clash of personalities left Pogba stripped of his captaincy then benched, will Pogba be able to get back to his best post-Mourinho? He has been off-form despite his proven pedigree. But he has a point to prove under the new manager and will make the most of any opportunity given to him. Up against a weak defence, on penalties and the sort of personality who will strive to perform just to have a pop at his former manager – this is the week to take the punt on Pogba. The second best defence in the league up against the second worst attack in the league, this one picks itself. Laporte has started 16 of Manchester City’s 17 games this season and there's no reason for him to not start again. In what appears to be shaping up as a two horse race which could run all the way to the end of the season, Manchester City’s 2 goal defeat to Chelsea made it advantage Liverpool. Pep Guardiola can’t afford any more slip ups. That 2-0 defeat was the first time all season Manchester City have conceded more than 1 goal in a league game this season. Add to the fact they have 8 clean sheets to date and that Liverpool don’t feature on Starting 11 this weekend, Manchester City’s defence is definitely worth backing. As mentioned earlier, I’m expecting a reaction from Manchester United on Saturday, with the players playing for the club and its fans. Luke Shaw has been one of the few players who has truly deserved to wear the Manchester United shirt this season. If he is given the freedom he requires I firmly believe he could still become one of the best left backs in the league, subject to the right manager backing him and nurturing his talent. We don’t really want to own defenders on Starting 11 just for a clean sheet. Luke Shaw is an ideal differential defender this week, if fit, and I’m expecting him to add to his 1 goal and 2 assists this season. After a couple of errors, I can’t bring myself to make it a Manchester City defensive stack by selecting Ederson, so I have to instead look to Kepa who this week takes on Leicester City. Like Manchester City, Chelsea also have 8 clean sheets this season although they have allowed many more goal scoring opportunities to their opponents which Kepa has denied. Leicester have failed to score during their last 2 games, they appear to be keeping their defence tight but are struggling to cause their opponents any trouble at the other end of the pitch, which bodes well for Kepa. Other than a few howlers he made during his debut season for Manchester United, De Gea is possibly in the worst form of his professional career. I feel the whole squad will be given a boost this weekend, De Gea included and I expect the Spaniard to bring home a clean sheet and potentially become a must own player for the rest of the season. This week, we're joined by the brilliant FPL General (follow him on twitter here) to discuss how we're shaping up going into the festive fixture pile-up, looking at things like premium player ping-pong, how we view the transfer market and how important we think the bench actually is. We also catch up with the Market forces, zombies, and All-Englands before taking some questions. Merry Xmas to you all - will try to speak to you again somehow (maybe Youtube so sub here to keep updated) this side of the New Year hopefully! Rotation has been the name of the game for many Premier League managers in recent weeks. With even Harry Kane warming the bench last week it shows nobody is safe and after a tough week of European action for the Premier League’s top sides, we may see more this weekend. Is there a way to avoid FPL heartache? The headline fixture of the weekend sees Liverpool host Man Utd on Sunday but we’ll also see an intriguing clash between Man City and Everton whilst Arsenal will be hoping Southampton don’t have the infamous new manager bounce. Tottenham will be hoping to follow up their miraculous Champions League progression with a comfortable home win against Burnley, which will make Harry Kane a strong favourite for the captaincy this week. As we’ve reached the point in the season where squads are getting thin ahead of January, this week’s selections are all bargain picks who might come into their own at this time of year. Afterall, a strong bench is imperative when rotation is afoot! Fresh from scoring the winner against Huddersfield last week, Torreira now has two goals in his last three games. Whilst I’m not portraying him as some sort of goalscoring midfielder, there’s no doubt that since the switch to three centre halves the Uruguayan has had more license to get forward. To read the rest of the article, click here! The undroppable Harry Kane may have been rested during Gameweek 16 but surely that’s not going to happen two weeks on the run? A home tie for Kane against Burnley is this weekend’s stand out fixture and he will surely be Gameweek 17’s runaway captain choice throughout all fantasy football formats. Four of Kane’s nine goals this season have come over the last six Gameweeks and with Harry’s hat-trick history during December, will this be the week he delivers explosive returns again? With Arnautovic injured, West Ham fans will be relying on Hernandez more so than even before over the festive period. He has scored 3 goals and provided an assist during his last three games. This week the Hammers visit Craven Cottage and a dejected Fulham side fresh from their 4-1 defeat to Manchester United. They have now conceded 40 goals this season. A natural goal scorer on form and with a wonderful fixture, get Hernandez into your Starting 11. With De Bruyne still injured and David Silva joining him on the treatment table, Bernardo Silva becomes a safe pick in Pep Guardiola’s starting 11. No matter who they face, we can expect goals from this Manchester City side. Therefore it's essential we have sufficient coverage from them. Bernardo Silva has four goals and three assists this season to date and he will certainly keep Jordan Pickford busy this weekend, with his teammates providing ample support. Back from his latest injury setback, Ramsey returns to the Arsenal squad for their fixture this weekend against Southampton. In any other season Ramsey would be a safe pick this week, but due to failed contract negotiations Ramsey finds himself in and out of the starting line-up – despite providing a goal and six assists this season as a utility player. A couple of poor games and everyone seems to be ready to ditch a bona fide fantasy football legend. Against Brighton this weekend, I expect Alonso to bring home his fourth clean sheet in six games. What we hope for is those attacking returns, which are long overdue. Can he add to his tally? Possibly. Against Manchester City he produced a professional defensive display. But prior to this even during a period when he was off form – he still continued to spend more time attacking in his opponents half than defending in his own. So keep an eye out on him this weekend. When Kolasinac signed for Arsenal last season he was meant to be the next Marcos Alonso. However a combination of injury and finding himself sharing the same space as Sanchez meant he didn’t produce the regular returns we hoped for. Now fit and playing under new manager Unai Emery, he has had 27 penalty area touches, created 3 big chances and produced an assist in his last four Gameweeks. It’s just a shame that Arsenal have struggled with clean sheets until last weekend. This week they travel to Southampton who have only scored 13 goals all season. Despite Everton having the goal scoring Richarlison or the creative Sigurdsson, their opponents Manchester City know how to keep clean sheets this season. 8 clean sheets in fact from 16 games, having only conceded 9 goals all season – a record only league leaders Liverpool can beat. Gameweek 15 proved that clean sheets are slim on the ground of late but I believe Ederson is a strong option this week. Then of course there is West Ham who continue to work through their favourable fixture list. Next up they are due to encounter Fulham. West Ham will allow Fulham chances, but Fabianski is in good form and will earn Starting 11 managers plenty of save points this weekend – can he produce another penalty save? He may have blanked at Old Trafford earlier in the week, but the Arsenal striker has registered three goals and an assist in the two games prior to that. Since signing for Arsenal, no other player has scored more goals in the Premier League than Aubameyang – matching Salah on 20. With a home tie against Huddersfield Town surely we can expect the former Dortmund player to return to his goal scoring ways? With only two wins all season for the Terriers this has an Arsenal win written all over it and bodes well for Aubameyang. He's not a player many Starting 11 managers will jump to after an appalling start to the season for Manchester United. However, with that said, the combination of injures and upcoming fixtures means that Rashford could be worth a cheeky punt this weekend. With Sanchez out, Lukaku off form and Martial a doubt, Rashford’s starting place is as nailed on as they come. He has only two goals this season but he has the natural talent to threaten any defence. That defence this week is Fulham’s, still bottom of the table and having still conceded more goals than any other Premier League side. Even with a new manager, they have the same ragged defenders. The debate between Eriksen and Alli has rumbled on for years and shows no sign of letting up. For me this week I favour Eriksen largely down to the form of Harry Kane who has started December in the manner we have all come to expect. The man assisting Kane is more than likely to be set piece taker. With four assists in his last three games Eriksen is a man we can rely on. Tottenham take on Leicester who have shown some defensive resilience lately, however I feel Spurs will be too much for the Foxes this weekend. With Arnie out someone has to step up and carry the Hammers forward. After impressing earlier in the season without the end product of fantasy returns Anderson has now scored four goals in his last six games. Great returns for a midfielder! Their opponents this weekend are Crystal Palace, who have only scored 11 goals all season – only Huddersfield Town have scored less. West Ham have taken 10 points from a possible 15 recently. With a favourable fixture run they are a side I'm expecting to see climb up the Premier League table. Despite the form of Callum Wilson for the Cherries, I would still endorse Alexander-Arnold for his potential attacking returns. Bournemouth are flying high currently. They are 7th in the Premier League, but have failed to keep a clean sheet during their last 5 games. Wilson aside, Liverpool are defending fantastically. The injury to Gomez strengthens Alexander-Arnold's position in the Liverpool starting 11 and I expect him to start again this weekend. For this weekend’s differential defender I have opted for a defender that faces a low-scoring team. West Ham are not known for clean sheets of late but this is a side who are on the up and growing in confidence. Balbuena had been ever present this season with the exception of the midweek rest. Fresh and ready to take on Palace he will be hoping to add to his two clean sheets and solitary goal this season. Quite frankly after Gameweek 15 I think it’s fair to say, there are no goalkeeping safe picks as all twenty Premier League sides failed to keep a single clean sheet between them. Where is our best chance? Maybe Arsenal's Leno. Ironically he hasn’t kept a clean sheet all season and Emery's team have looked defensively weak. But surely all of that has to change eventually? What better chance of keeping your first clean sheet than against the side who have scored the least amount of goals this season? When it comes to differential’s we have plenty and as much as I dislike him, Joe Hart could be an option. He continues to record high scores on Starting 11 due to the number of save points he is registering. With the ever-green Glenn Murray an injury doubt, maybe, just maybe Hart has a chance for a shut out. Can he add a clean sheet bonus to those save points? FPL: 5 players to watch in GW16 – Arsenal to continue good form? The dust from the midweek round of games has barely settled but already it is time to turn our attention to another set of fixtures. The games come thick and fast at this time of year and as Premier League managers shuffle their packs, here are five players for you to consider to keep those arrows green. It’s an intriguing weekend of fixtures as FPL favourites Chelsea and Man City clash at Stamford Bridge whilst Liverpool face a tough looking trip to Bournemouth. With some key European fixtures looming, is there such a thing as a safe bet this round? It’s not exactly a gamble to say the Premier League’s top goalscorer would be an excellent addition to your FPL squad. Sure, he didn’t find the net in a crazy game at Old Trafford but the visit of Huddersfield Town this weekend should give managers an optimistic feeling. It’s followed up by a trip to struggling Southampton before a home clash with Burnley. There’s therefore plenty of mileage in picking Arsenal’s main man who should be spared the rotation risk as Arsenal are already through in the Europa League and will surely play a shadow side next Thursday. This week, with the FPL Gameweeks coming thick and fast, there's no time for a full on pod but we took to YouTube to record a brief "WGTQ+A" talking about our plans to tackle the next couple of Gameweeks as well as answering key questions from twitter and the stream.